When you can’t move mountains, go climb one. 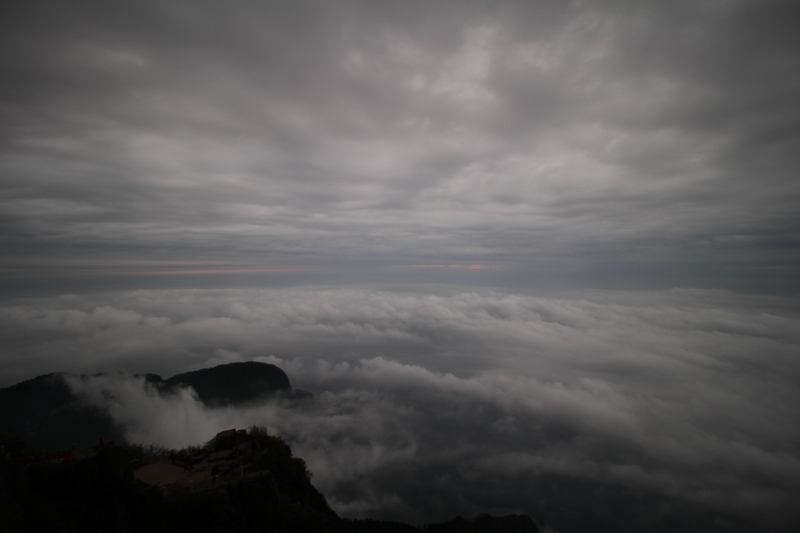 I don’t know why but I have a thing for mountains in China – I have been atop two before and am always hungry for more. I think it’s the fact that they are ancient, and sagacious for having lived through so much history. Great Chinese poets, painters, and philosophers have all been inspired by a mountain at one point or another and it is easy to see why. Glorious ridges, jagged cliffs, and 90 degree drops dotted with lush greenery shrouded in dreamy fog and cloud cover create the perfect backdrop for one to be elevated to a higher level of self. 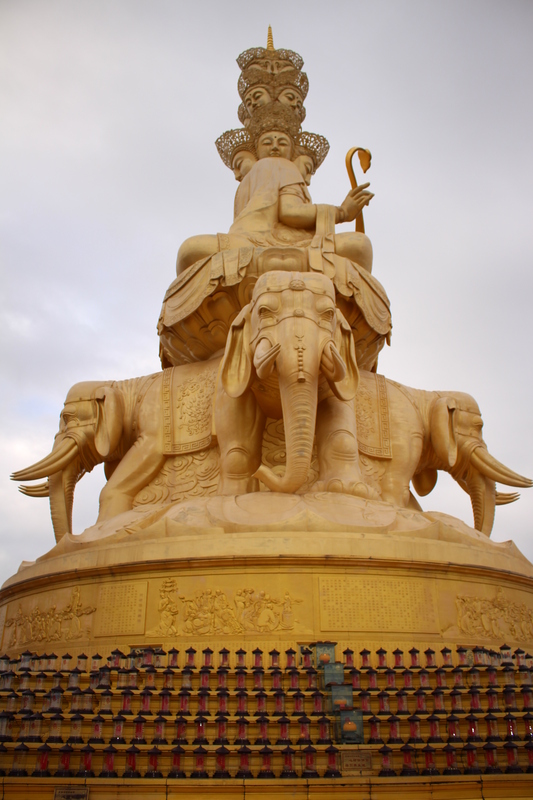 What better way to achieve this than on a Buddhist mountain? 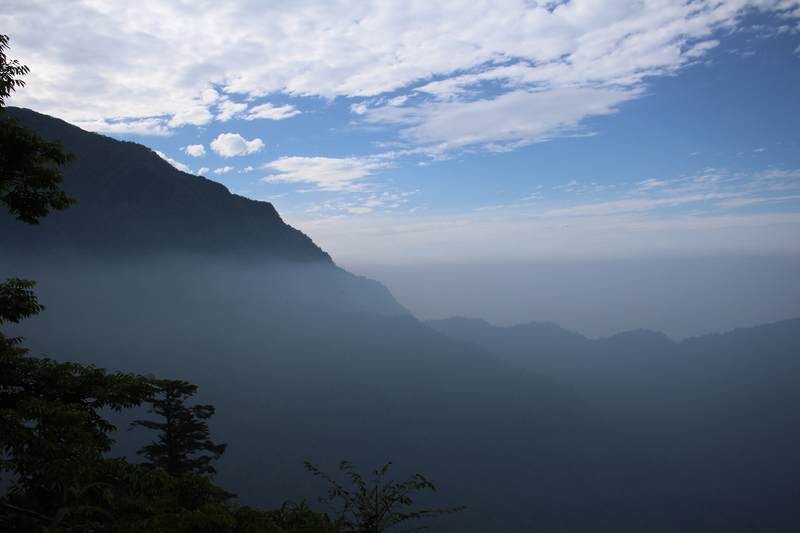 Emei Shan is one of four famous Buddhist mountains in China. I was sold on visiting this sacred place on our trip and was even more excited that we were actually going to attempt to summit it and stay the night at a monastery. Romantic indeed, this fulfilled my dream to uncover mysterious mountain paths and find my moment of zen alone in a cloud forest. 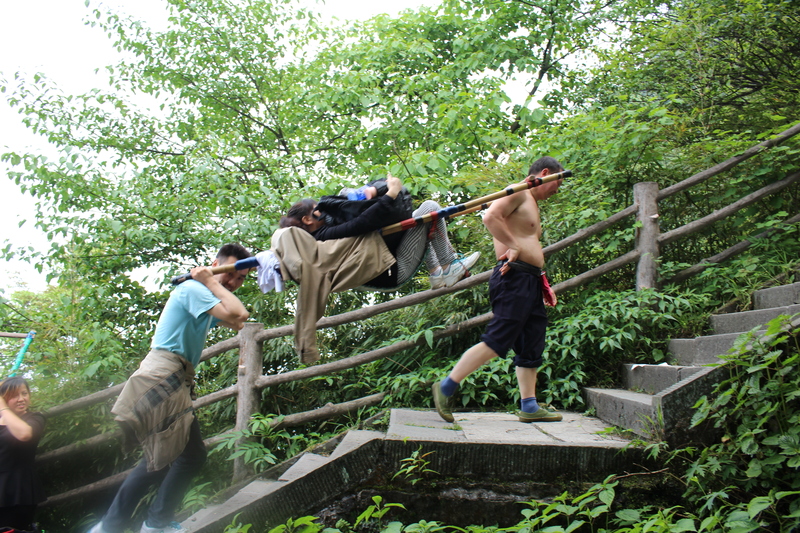 And so, leaving our luggage behind at a hostel, away we roamed, off to scale the mountain, with nothing but the clothes on our backs, a toothbrush, a paper map, snacks, and our bamboo walking sticks. 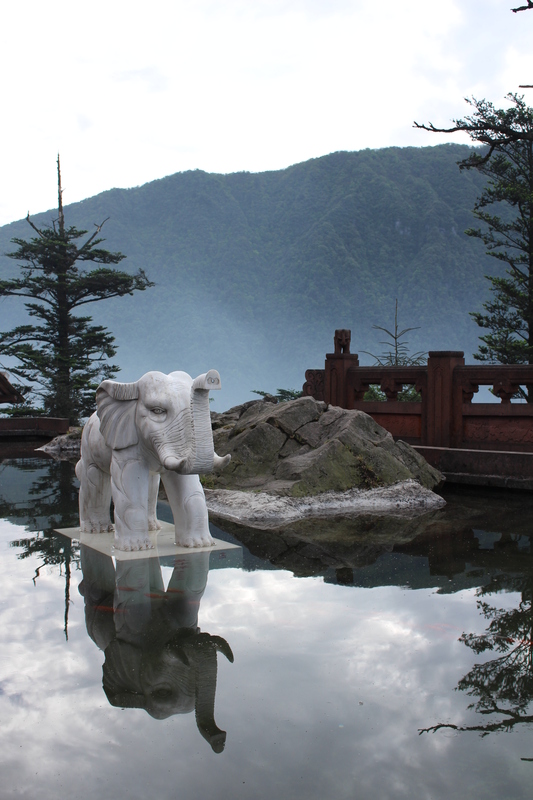 Upon approaching the mountain at one of the entry points, we were surprised to be met with lush green vegetation – it felt more like a tropical forest in South America rather than a Buddhist mountain in China. Where was the fog and mysterious aura? Regardless, it was beautiful all the same as our eyes adjusted to the sea of greenery before us. 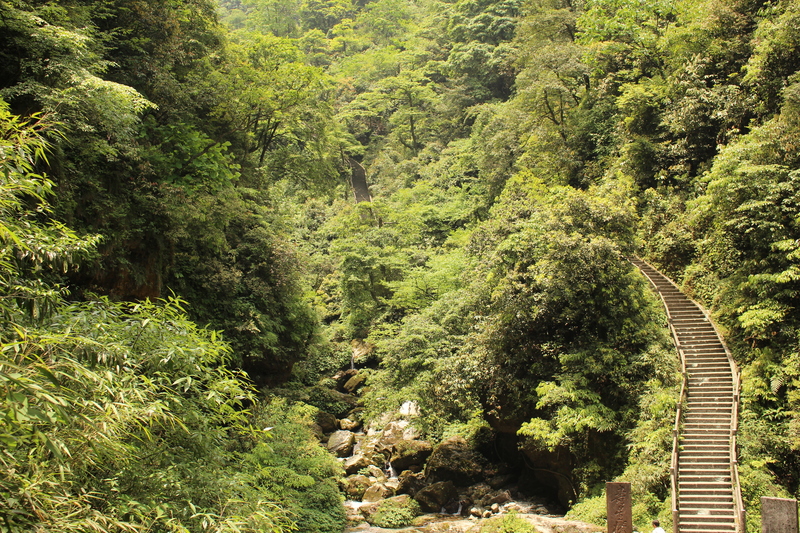 Enveloped by humid heat and lush flora, we worked up a sweat in no time. We continued along the paved path with the sounds of our thudding footsteps rhythmically interchanging with the thunk of our sturdy bamboo walking sticks striking the ground in an even cadence. We were completely alone with nature. Birds serenaded us with the most melodious songs. The buzzing sounds of cicadas and other noisy insects filled our eardrums with every turn, like a continuous flow of white noise that eventually became deafening. The steps were never ending, and we grew tired rather quickly. 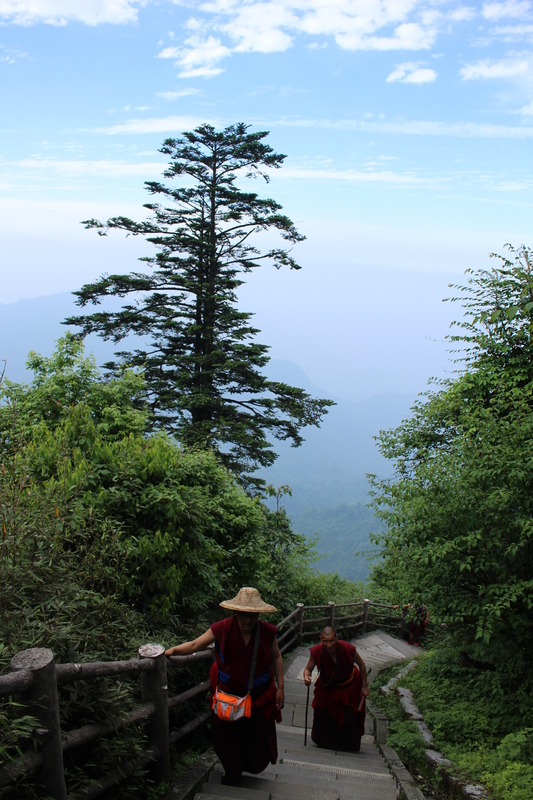 While the paths ascending the mountain are all well paved with steps, many of them are narrow and steep. Anyone who continually climbs stairs for several hours non-stop will agree that it is physically demanding, requiring stamina, endurance, hydration, and frequent bouts of talking to oneself to stay motivated. Between the two of us, I was the cheerleader for the team, giving pep talks to ensure we would maintain the pep in our step as we climbed endless steps on our ascent. Perhaps it was the adrenaline pumping through our veins, the infinite steps, the zigzagging switchbacks, or the thinner air as we steadily ascended closer to the heavens, but we agreed to put off eating until later in the day, once we made it to a significant milestone on the mountain. Little did we know, we wouldn’t sit down to eat until sunset. Surviving on nothing but water and over priced Snickers bars purchased at snack shacks along the mountain, Simon and I pushed on, dragging our legs, now feeling heavier than lead. Step by step, we were determined to climb as high as we could before nightfall. Alas, we couldn’t beat the facts and illusion that we were faster than the average hiker. The map was right: it really took us ten hours to make it to the second to highest station on the mountain, a mere two hours away from the summit. Originally we were planning to stay at a monastery, and we were prepared for a night of meager accommodations. Instead, we were pleasantly surprised to find several hotels. It didn’t take long for us to find a place, and after bargaining for a good price, it was one of the nicest rooms we had stayed in ever since arriving to China. I was kind of sad I wouldn’t live out my dream of staying at a monastery on a Buddhist mountain, but at that point my tired body just needed a good night’s rest and I wasn’t going to fight comfort. We were jolted awake by a firm knock on the door. It was the hotel’s wake-up service at 4:30 am. Simon and I were reluctant to roll out of bed, our muscles now extremely sore from the ten hour hike we had just completed only hours ago. But there was no way we would miss the sunrise. 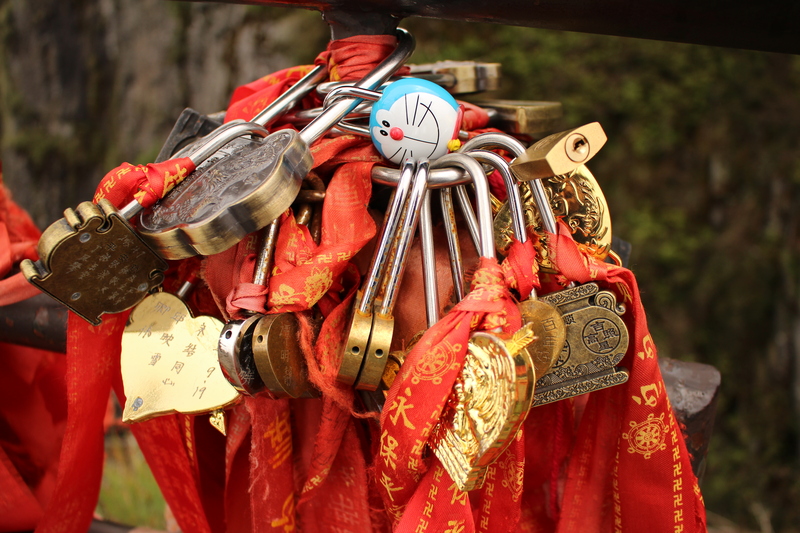 No more climbing up the mountain for us – we decided to take the gondola ride up to the summit. As soon as the gondola broke above the clouds, the buzz of conversation stopped as a hush fell over the crowd. A unison exhale of “wow” escaped everyone’s lips as we rose higher and higher above the sea of clouds, with the beginnings of the sun breaking through in a slim glimmer of golden light, surrounded by hazy purple clouds. It was like literally watching the the night melting away into dawn and seeing this serene sight put my fear of heights at ease. Buddha’s Halo, as they called it. Everything we worked so hard for was rewarded by this beholden sight. I suddenly forgot about the growling hunger in my stomach, the soreness in my muscles, and numbing cold I felt being windswept on that summit so early in the morning. All I felt was an overwhelming sense of happiness to share this moment with Simon, as I let the feelings of gratitude wash over me. 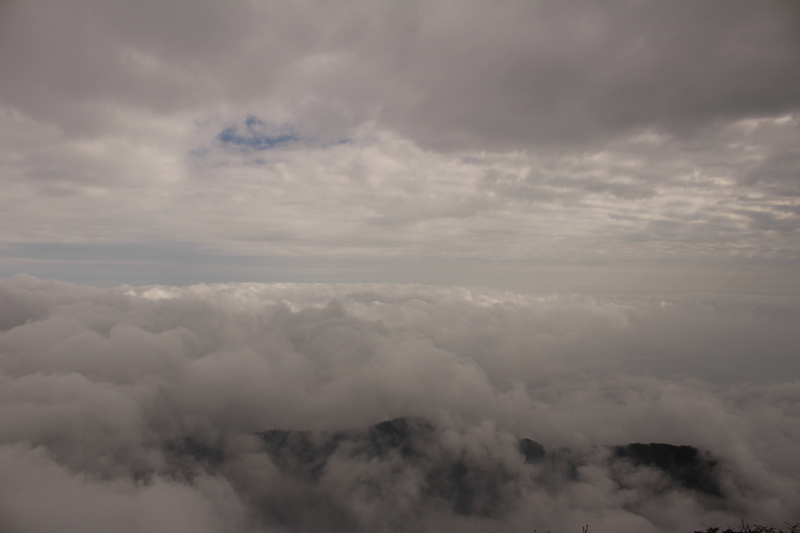 We were high above a sea of clouds on top of a mountain in China, one that we summited from the ground up. It’s the closest thing to seeing what heaven looks like on Earth. whoa. great imagery and detail here, like the sounds of cicadas and the sight of purple clouds. it makes the experience all the more richer, and gives insight that the pictures don’t convey. 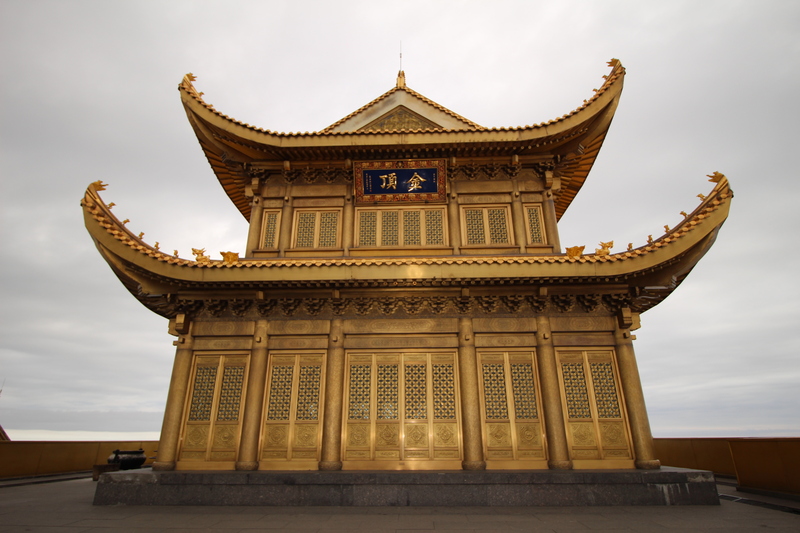 is it called a Buddhist mountain because of the monastery/temple at the top? I’m glad that my words helped paint a complete picture for you. It is an experience I will never forget. 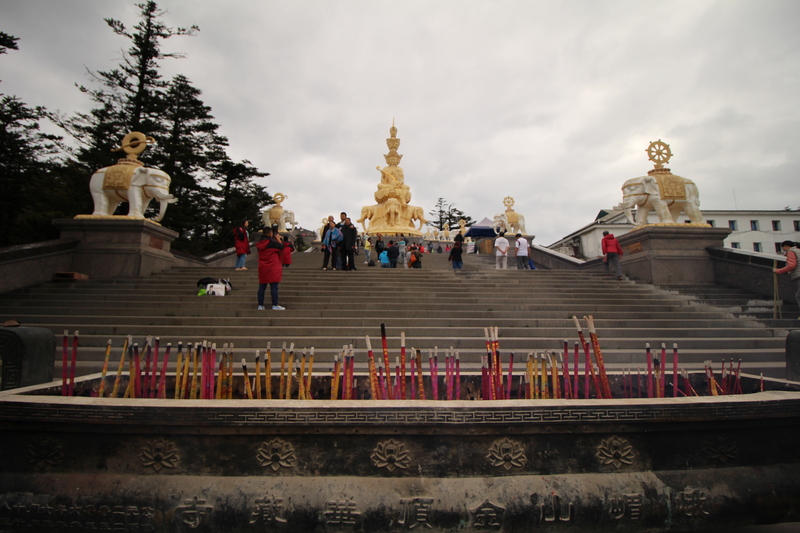 Emei Shan is one of four sacred mountains in China, because it is believed to be the location of enlightenment for the Bodhisattvas. Thus, many temples were built all throughout the mountain. It’s really quite amazing.